This is our testament to how amazing WHITE BRAZOS VALLEY SHEPHERDS are as an overall specimen of the German Shepherd breed. I have truly never been more impressed with how smart, sweet and mild mannered the behavior is exhibited from our new puppy. Our puppy is healthy with a beautiful white coat and a perfect disposition. He adjusted right away to his new environment. He is fabulous with my two boys and enjoys long walks and playing fetch. We are truly blessed that we were able to connect with Frances Cobb and her dogs. Her love and dedication to the breed shows in the reflection of the commitment she makes not only to the animals but to the new owners too. I highly recommend her exceptional dogs to anyone looking for a new family member. . . . We absolutely love Brady, he is a God send! We recently purchaced our White German Shepherd puppy from Frances at White Brazos Valley Shepherds and it was an incredible experience! Nala's paperwork and shot records were all ready for us on our arrival, and Frances was super friendly! We have had a wonderful time with Nala since we purchaced her and Frances has even followed up with us to make sure things were going well! Thankyou White Brazos Valley Shepherds for a beautiful puppy and a great experience! Ķepa is such a great pup! I've had many people compliment me on how well-behaved she is for a puppy. She was very quickly house-trained and quick to learn her general training (although this is obviously still ongoing). Ķepa is very popular at the dog park; very playful but a touch submissive so as to not be too intimidating. She seems to walk around thinking everyone loves her, and likes both people and other dogs equally; just a very social pup! So far, she​'s been quite fearless. We're just starting to learn to swim and I'm hoping to get her out on my SUP in the next week or two. I get compliments all the time on what a gorgeous dog she is. I'm terribly biased, but I do think she's very striking. Thanks a lot for checking in on us beyond adoption day! Very happy. We already have a tight relationship. . . . is getting along with all my other critters. Lady Bella of Texas has been a wonderful addition to our family. Her temperment and playfulness has been an enjoyment. She loves my two boys and protects them. I am very pleased with White Brazos Valley Shepherds and highly recommend them. Thank you Frances. Thank you White Brazos Valley Shepherds for such an awesome puppy! We could not have asked for better! Mose was able to get acclimated to his new home very quickly. He was easy to potty train and crate train! (We were surprised about how easy this was!) Mose is the center of attention where ever we take him. We constantly receive compliments on how beautiful of a dog he is! He is such a loving, caring, playful pup we're fortunate to call him ours! Mose got away during a bath. We are extremely lucky to have found Frances at White Brazos Valley Shepherds. She was so helpful throughout the entire process (even after we picked him up) and was kind enough to share pictures of Mose until we were able to pick him up! 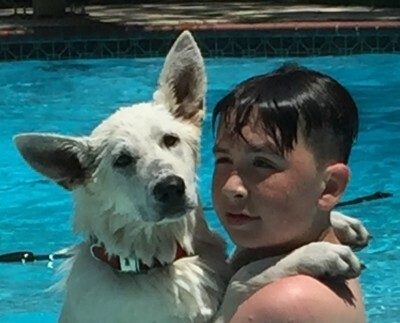 We highly, highly recommend White Brazos Valley Shepherds for your White German Shepherd! Thankyou for introducing us to Nimbus. He's been a great addition and extremely smart. Nimbus is an amazing puppy, extremely smart, a fast learner and has had a great temperment towards our pets. We were extremely pleased to meet Frances. Thank you for bringing Nimbus into our lives. Nimbus ready for the holidays. He's smart and learning fast. . . . Everyone compliments him​​. Kiah is growing so fast, he looks like a teenager now, lol. He was a perfect addition to our family and is so loved! He's so smart, only took him about two weeks to catch on to the potty training and now knows how to ring the bell on the backdoor when he needs to go out. He's doing really well with his commands also, sits like a perfect litlle genleman, will shake your hand and show you how to swim if you want him to. . . . Thanks again for our little boy, we love him sooooo much! He's a really great dog. . . . he learns really quick and he's very smart. . . . he's definitely loyal. Tundra [is] doing great!! He is so gentle and loving. Everyone loves him. Thanks again for all you did for us.